Update 10: Emmanuel Macron has arrived on scene, and is giving a speech outside the cathedral, after authorities claimed that the body of the cathedral has been ‘saved and preserved’. Meanwhile, a drawing of Quasimodo, the animated hunchback of Notre Dame from the 1996 Disney film, has gone viral as a symbol of mourning and loss after the tragedy. And here’s a look at tomorrow’s front pages. Update 9: The Vatican has released a statement on the fire at Notre Dame bemoaning the tragedy and offering prayers for French Catholics. Offering another silver of good news, officials told the French media that the North bell tower might be saved. Officials said they were more optimistic than earlier, and there is reason to believe both towers could probably be saved. 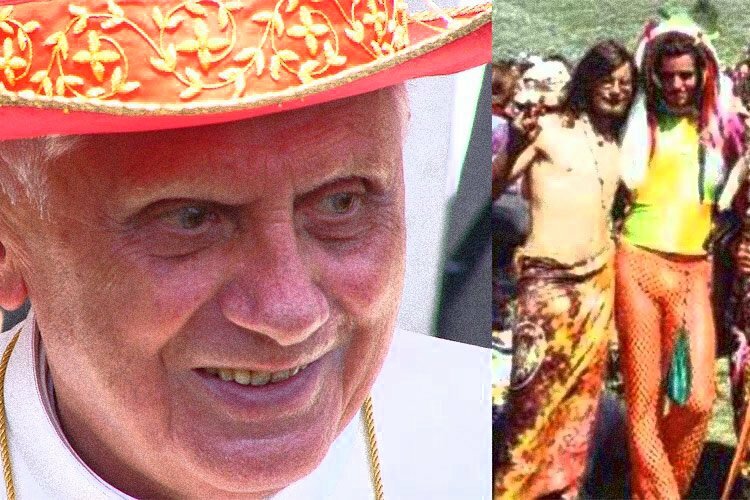 Meanwhile, as one Twitter account pointed out, a number of historic tragedies have unfolded on April 15…could this be a sign from the universe? As thousands gasped in horror along the banks of the Seine, keeping vigil late into the night as the iconic cathedral smoldered, some on Twitter tried to find humor in the midst of tragedy. 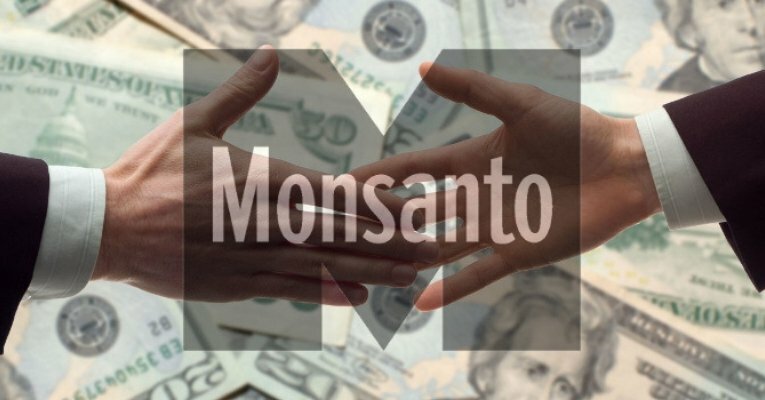 and ignite the Apocalypse of the Yields." 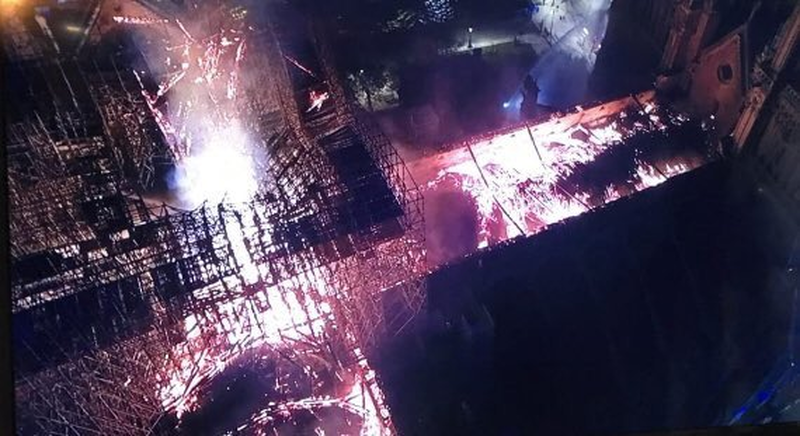 Shedding more light on the cause of the fire, an expert in New York told the NYT that construction and renovation fires at old churches and synagogues aren’t that common (an iconic church in NYC burned down last year under similar circumstances). Rebutting Trump’s suggestion that France try to put out the fire by dumping water on the blaze via the air, French emergency services said such an operation could cause the whole thing to collapse. Speaking with bystanders on the banks of the Siene, the NYT recorded reactions ranging from sadness to terror. Christine Lagarde weighed in on twitter, saying she shared the sadness of the French people. One can’t help but wonder how the destruction of Notre Dame, and the presumed hit to tourism revenues, might impact France’s growth prospects. 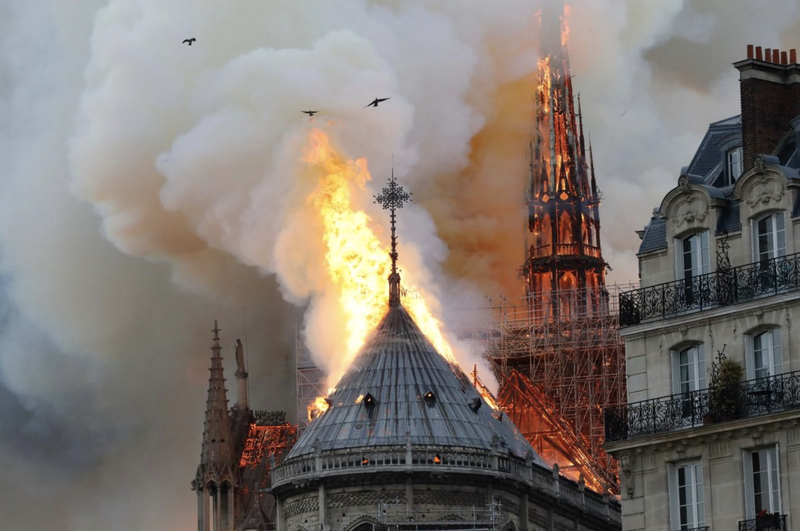 Like so many others in the world whether French of not, I share the emotion of the Parisians and French people as the fire engulfs Notre-Dame cathedral in Paris. 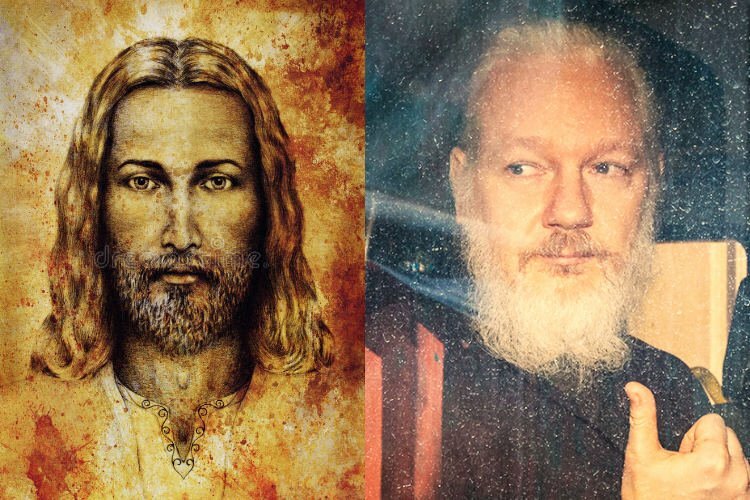 Update 6: A priest at the cathedral has told reporters that all of the priceless artwork inside the cathedral has been saved, including the crown of thorns and that “the treasure of the cathedral” is intact. Unfortunately, the same cannot be said for the building itself. 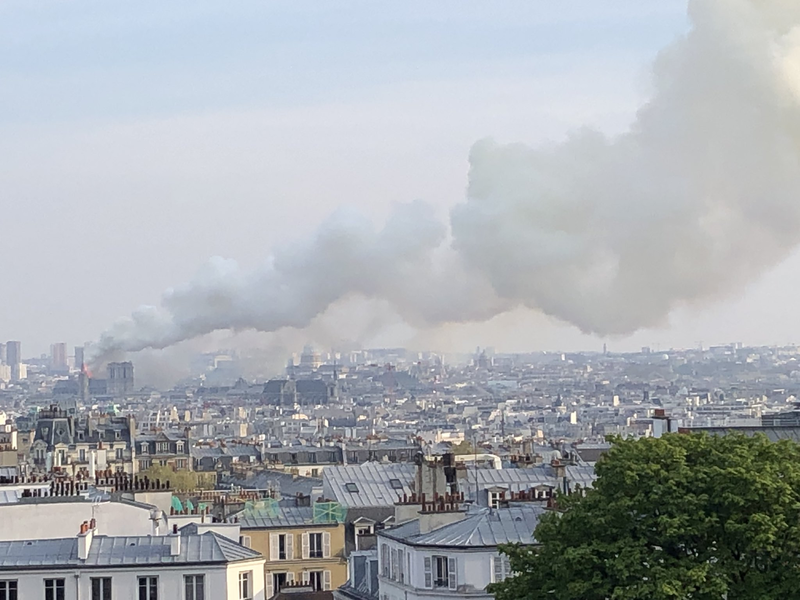 Update 5: Though police quickly assured the public that the cause of the fire was accidental, Paris prosecutors have reportedly opened an investigation into who/what started the blaze. 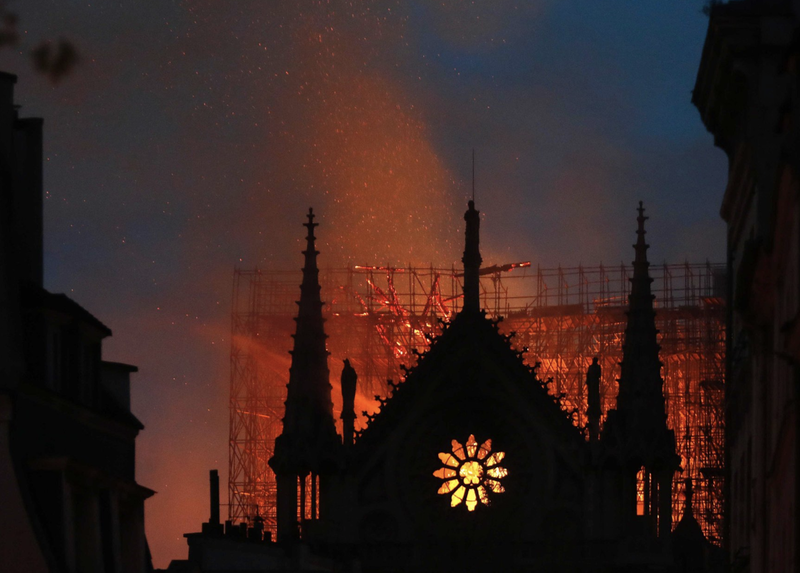 Though officials say the fire looks like an accident, it’s certainly curious that ten Catholic churches have been vandalized across France in the span of a week. With the inside probably irreparably damaged, if not completely lost, some are sharing photos of the interior of the cathedral. 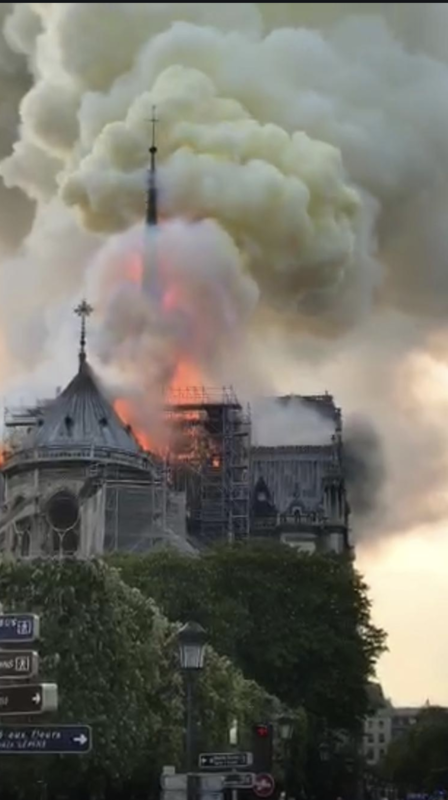 To recap, the cathedral’s 15-foot lead spire has collapsed, and the roof has as well, during holy week on the Catholic calendar. Update 4: Though he was tweeting before the spire collapsed, this thread from a former state public safety official in the US offers some insights into the monumental task facing the Parisian firefighters as they rush to save the cathedral. This is (most likely) what is causing the fire to “run the roof” as seen in the first picture. The fire is essentially burning unchecked. If it started high in the building, Paris Fire may be able to save the walls, but roof is basically surrounded at this point. 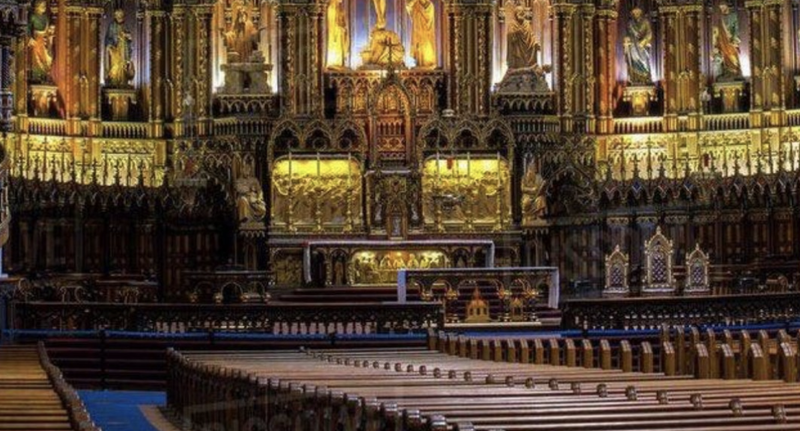 The first issue is how old churches are built – heavy timber construction with large open spaces and very few (if any in a church like #NotreDame) fire stops. In firefighting there is something called a "trenchcut" that basically opens a large roof up from peak to gutter, allowing space to stop fire spread. In short: Saving the cathedral might be an impossible task. 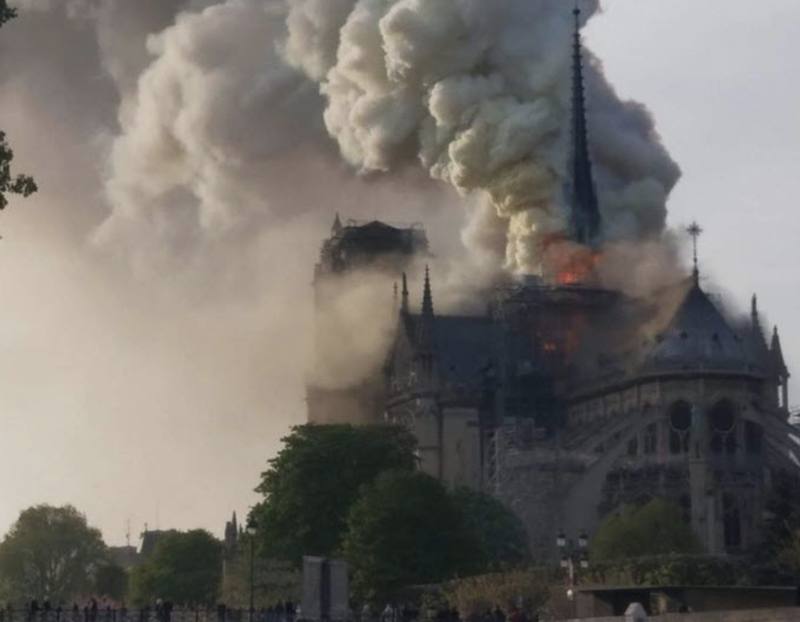 Update 3: It’s looking increasingly likely that the cathedral will be burned to the ground after a church spokesman confirmed that its entire frame is on fire after the spire collapse. 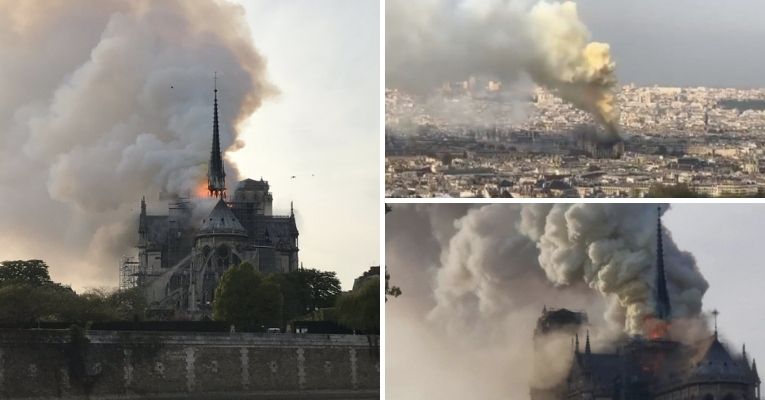 PARIS (AP) – Paris emergency services now trying to salvage the artwork stored in Notre Dame Cathedral from the huge fire. French firefighters are still putting together a plan to put out the blaze. 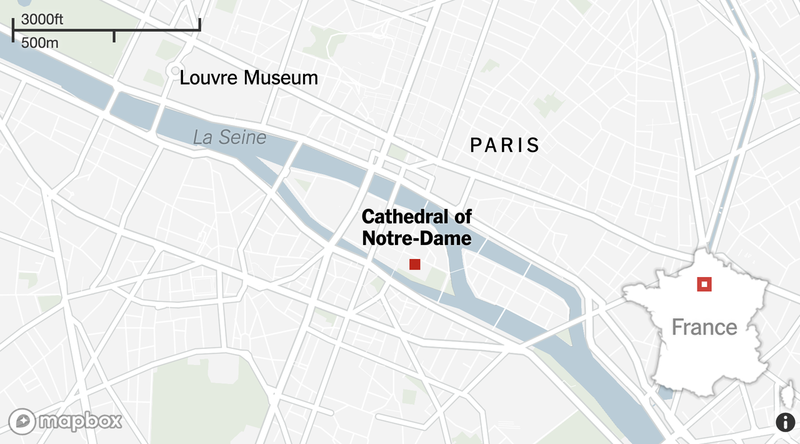 The cathedral’s location on a small island in the middle of the Seine certainly isn’t helping. This is an extremely difficult intervention for firemen. Most of the areas burning edge the Seine river so they are struggling to find places to position the water hoses. And the height of the roof makes it difficult to reach. 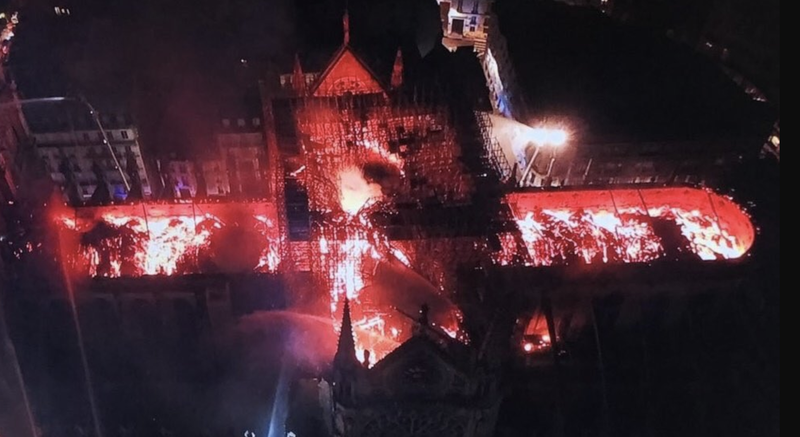 Though the cathedral has endured a number of threats during its more than 850 year history, the damage from today’s fire is unprecedented, one source claimed. Update 2: The cathedral’s spire and roof have now collapsed. Since officials are blaming the fire on an ‘accident’ related to the renovations…just imagine renovating one of the world’s most historic landmarks then accidentally burning it to the ground. The neighborhood around the cathedral has been evacuated and Macron is reportedly on his way to the scene. Huge crowds have gathered around the banks of the Seine to watch in amazement as the cathedral burns. Here’s a live feed of the fire. 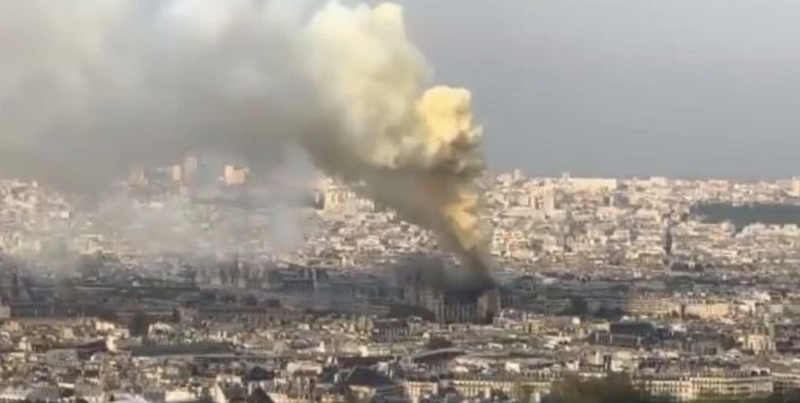 At this point, firefighters attacking the blaze are treating it as an accident somehow related to the “massive” construction happening at the cathedral, which was being renovated. Police later confirmed that the fire was an accident linked to the renovation work. 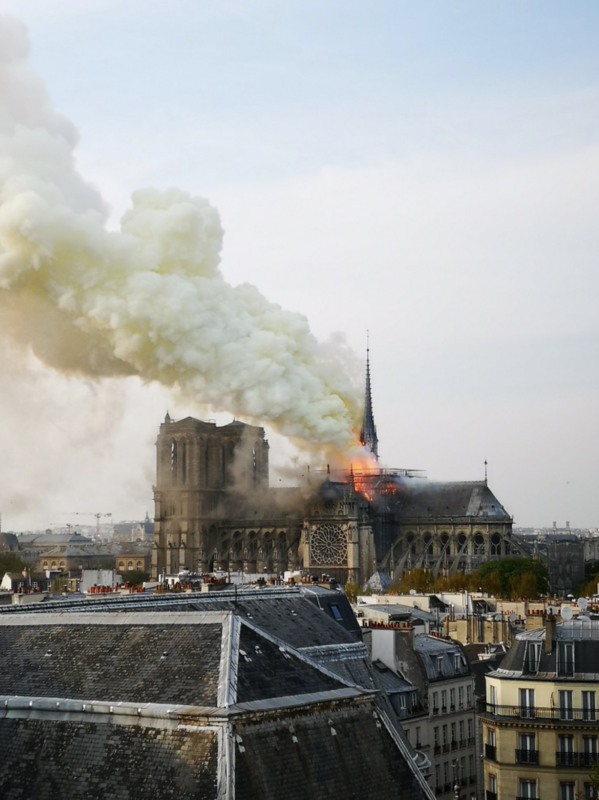 The cathedral had been undergoing a $12.5 million renovation financed by the French state, after the Catholic church in France launched an “urgent” campaign to raise funds for the renovation, because the cathedral was starting to crumble. Cracks had started appearing in the stone at the cathedral, sparking fears that it could become unstable, according to the BBC. If there’s a silver lining, many of the historic statues were removed by crane just last night. 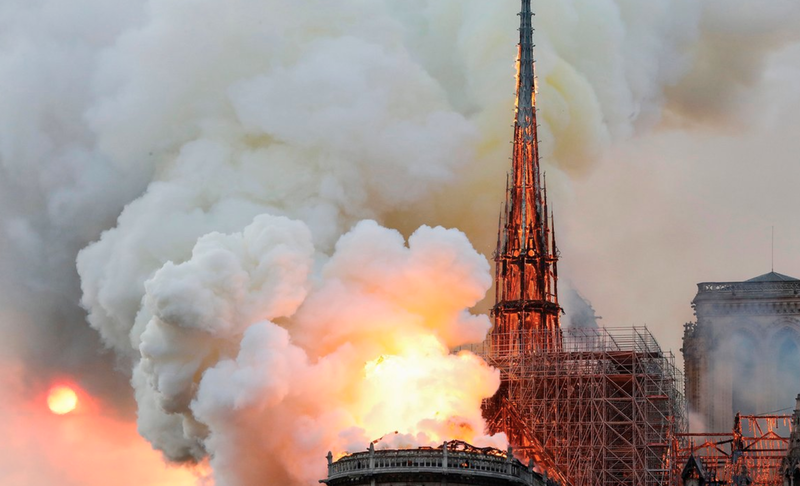 At this point, it looks like the cathedral’s spire has been totally destroyed. French President Emmanuel Macron has postponed a policy speech to attend to the disaster. 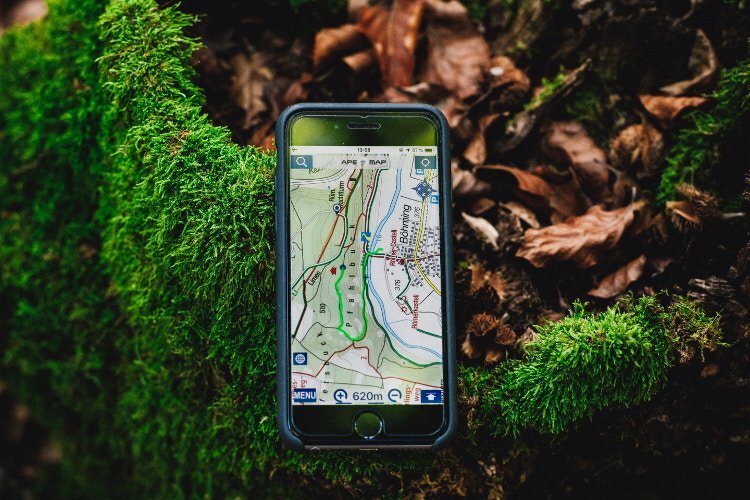 He had been planning to address the nation to announce plans to address the concerns of the gilet jaune protest movement. Monday night but that speech has reportedly been cancelled. 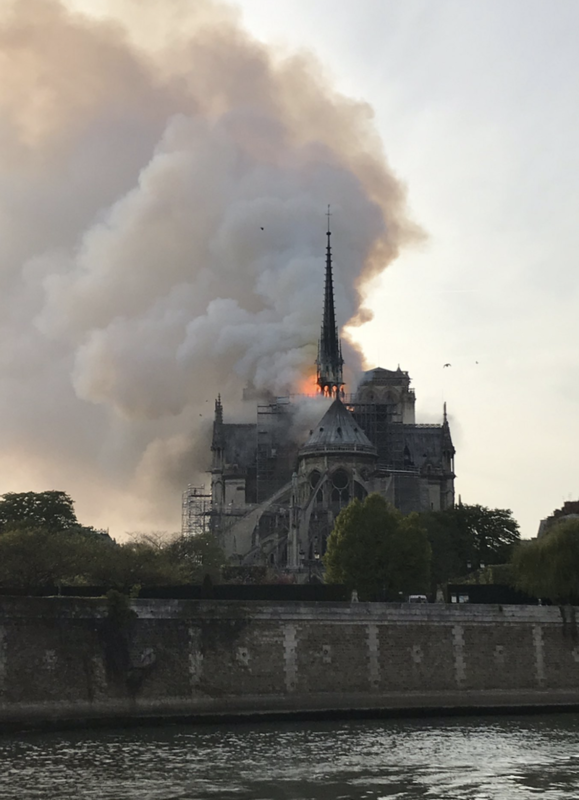 The cause of the fire at the 856-year-old cathedral isn’t yet clear – though officials said it could be linked to renovation work. Construction on the cathedral began in 1163, and the building opened in 1345. Today, it is the most visited tourist attraction in Paris, drawing 13 million visitors per year, beating out the Eiffel Tower. Paris Mayor Anne Hidalgo tweeted about the “terrible fire” and asked people to stay away.